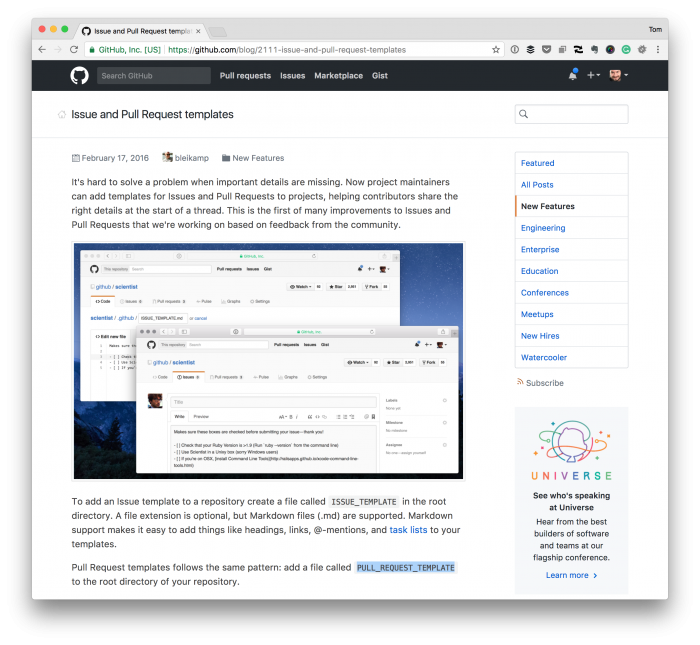 If you do any work – regardless of if it’s open source or closed source – (though I know most who use read this site are involved in open source), you likely use some source control, and it’s probably GitHub. For many of you, you either follow a project, contribute to a project, or handle pull requests to a project. And what about those projects that you work on with a team? But what do you put in the template for the pull request? Is it the same every time or is it different? What about if the content of the PR is related to something in Trello, Asana, Basecamp, or some other project management system? That’s where GitHub PR templates come into play. And the idea is simple: We create templates for issues and pull requests for others that provide a level of information that they must fill out before submitting an issue or a pull request. This helps us, as maintainers know whatever information it is that we require before looking into it. Further, it may allow us to link to a prior issue, previous ticket, prior anything related to the project. a link to the ticket in your project manager to which the PR is relevant. I’m not saying that this is the information that’s required, but it’s something we’ve used, and I’ve found useful (and it’s nice to see more improvements being made over time). But How Do We Use This? Each of these should be markdown files that stub out exactly what it is that you’re looking for your contributors to include whenever they are, y’know, contributing to your project in some way. And then, whenever a user looks to report an issue or create a pull request, they have prompted with the information from the template. You may not think it’s much, but it’s a pretty easy to help improve the quality of the information coming into a project, have your contributors think about what they are putting into the project, and then respond accordingly. Plus, it helps you and the rest of your team understand what it is that’s about to be reviewed and to prepare for any changes that may come their way when working on these projects.